In 1987, Steve Wilhite gave the world an image format that would forever change the Internet: the GIF. Here are 15 science experiment GIFs—and what's going on in each. You’ve probably played with thinking putty at least once in your life. If you haven’t, what you need to know is that it has viscoelastic properties, so you can pour it like a liquid but also bounce it like a solid. It’s also a dilatant fluid, meaning it will thicken increasingly with applied shear stress. Magnetic putty is the same substance, only this time, an iron oxide powder is added. The iron oxide will make the entire substance react to magnetic forces. Now all you need is a magnet, like the sphere above, and your putty will act like it has a mind of its own. Check out how you can make it yourself. We’ve seen people on skateboards and motorcycles loop the loop many times. Damian Walter is the first human to do it on foot. To run it without falling, you need to reach the right speed; then, centrifugal forces will keep you locked on the track. Note how his shoulder line stays dead center of the loop. For this particular one, Damian needed to accelerate up to 8.65 mph in the highest point to be able to gain enough inertia as to rotate his body and legs around his head fast enough, so when gravity finally wins, he’s already feet down on the track. The full video is part of a Pepsi promotional campaign. The edge of the table is a magnet and the puck is a regular wafer coated with a half micrometer (around one-hundredth the width of a hair) veneer of superconductor. Superconductors conduct electrical currents with zero resistance when cooled to extreme temperature (which is why the puck is frosted). The levitation is possible thanks to quantum locking (also known as flux pinning). Superconductors have zero electrical resistance, and they always want to expel magnetic fields from themselves. In this GIF, because the superconductor layer around the wafer is so thin, some magnetic field gets "trapped" inside it. The superconductor can’t move the magnetic field without breaking the superconducting state, so the trapped bits of magnetic field just stay there, locking the puck in a hovering position in midair. And because the track is a circle with the same magnetic field throughout, the puck can travel around without ever breaking the lock. If you want to see something really cool, the puck does the exact same thing even when flipped upside down. Venus’ orbit around the Sun takes 224.7 Earth days. At first it just seems like a random number, but when scaled in time, we see that both planets interlock their orbits in a 13:8 ratio (Venus: Earth, respectively)—so for every eight years on Earth, Venus cycles around the Sun roughly 13 times. When we trace the two orbits for that time and draw a line between them each week, we see they draw a beautiful 5-fold symmetrical pattern. If we map each point when the two planets align with the Sun and run imaginary lines, we see a near-perfect 5-pointed star. Here's more about this phenomenon, and here's a very cool simulation. The slinky is simply a spring. When a spring is stretched, tension tries to pull it back together towards a collapsed state. The spring’s tension is occurring mostly symmetrically, so it pulls all ends towards the center. When dropped vertically, the bottom end is trying to fall down, but tension acts in the opposite direction, so the bottom of the spring remains stationary. Meanwhile, the top end is collapsing with G (9.81 m/s2) and spring tension. It's not until the rest of the spring hits the bottom of the spring, eliminating the tension that had counteracted gravity, that the slinky finally collapses and falls to the ground. Here is the Veritasium video this GIF is from, which explains it in more detail. Some plants have figured out astonishing ways to reproduce, including the jewelweed (Impatiens capensis), also known as the spotted touch-me-not. When the seeds mature enough to start a new generation, their pods develop a nastic response and explode, dispersing the seeds in the environment. When the time comes, the cells of the seed pod accumulate and store mechanical energy based on their hydration level. Any external stimuli then overloads the system, and the walls separate and quickly coil up on themselves, transferring energy to the seeds and launching them outwards. This study from the Journal of Experimental Biology explores how this mechanism works. When it’s dry outside, pine cones open up to disperse seed. When it’s damp, it’s no longer a favorable condition, so they close to protect them. Pine cones are the most common example of a hygromorph, which changes shape based on humidity levels. The cells inside the cone are dead, and the triggered response is completely automatic. When they’re dry, a small section of the outer layer of the scale near the mid-rib shrinks, pulling the whole scale back and opening it up. When it’s damp, the moisture causes the layer to expand in such a way that it closes the cone. Here is a detailed study on the subject. Water printing, a.k.a. hydrographics, is a fast and efficient method to coat an object. The hydrographic film is first placed on the surface of a tank with water. The film itself is soluble in water, so after a short time, it dissolves, leaving the ink calmly floating on the surface. The item is carefully dipped inside as to accurately transfer the texture and details of the film. A swirling motion disperses the ink to ensure the texture stays perfectly printed. The object then needs to dry and get a clear coat finish, just like any other printing process. Here's a Q&A about water printing. Ants, being the social bunch they are, figure out that by grouping and acting like a single body, they can counteract external forces very effectively and, as a group, adapt to a variety of situations. By latching themselves to each other, they can create a single solid mass that’s elastic and springy in nature. This, for example, allows them to endure a big push, which would otherwise throw off a single ant. When they need to be more flexible with their surroundings, they simply move around within the body of ants and it allows them to act as a fluid and easily overcome obstacles. Take a look at this great production by the New York Times. When you notice that the air bubbles “fall down,” you’ll realize these divers are actually walking upside down on the underside of the ice on a frozen lake. This becomes possible when they inflate their gear with air, which increases their buoyancy and makes them go up. A little fine tuning, and they can simulate gravity upside down. They can do that as long as they have air in their bottles, because the water pressure around them is supporting their entire bodies from all sides. Watch the original video. The watermelon’s outer wall is usually pretty rigid and durable. Slowly wrapping rubber bands around it gently increases external pressure, which is squeezing the interior of the watermelon onto either side of the rubber band, increasing the pressure on those other areas. Notice also how they go along the short side, which is weaker than the longer one. At around 500 rubber bands, the external pressure eventually forces the watermelon to distribute so much internal pressure to the upper and lower shells that it cracks the outer wall (notice how the first crack appears at the very top, and that’s quickly followed by a crack a couple inches above the rubber bands. Those were weak points). And without watermelon inside, the wall is much easier for the rubber bands to break. 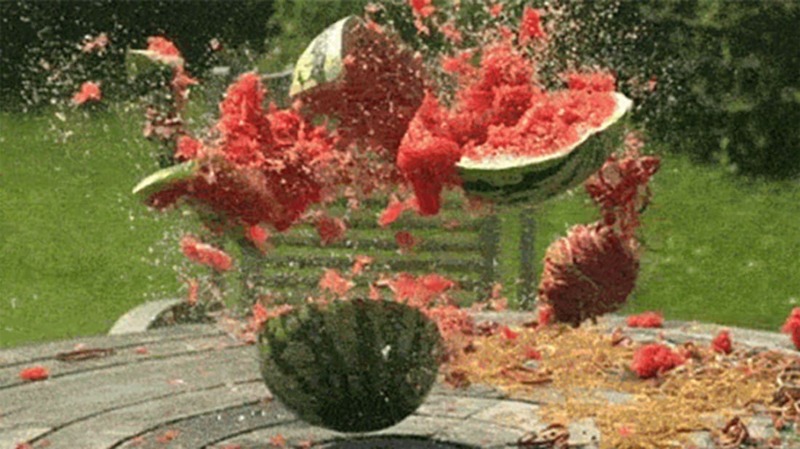 After they’ve gone through the wall, the flesh of the fruit provides little resistance, so they snap and transfer all the force to the melon from the inside, which makes it explode outwards. Here is the original video from the Slo Mo Guys. One full revolution of the Moon around the Earth takes about 29.53 days. In this time it goes through several phases, all of which are characterized by the portion of the Moon that’s visible to the Earth. In the new moon phase, the Moon stands between our planet and the Sun. Since the Sun is the only major source of light in the Solar System, the moon is in shadow. (That faint brightness on the moon around this time is because of earthshine—sunlight reflecting off the Earth onto the moon.) At the opposite end of this cycle, the “Full Moon” phase, the Moon is on the opposite side of the Earth, illuminated by the Sun, and thus we see the entire side of the Moon that always faces us (thanks to tidal locking). Here's some good reading material on lunar phases. Glass is a peculiar material. It’s incredibly durable to compression, to the point where to shatter a cube of one cubic centimeter, you’d require a load of 10 tons. Regardless, the average tensile strength of glass is very low, making it amazingly weak against fast and focused blows. Scientists have yet to discover exactly how glass shatters on an atomic level, but at least we can enjoy these beautiful fractals while we're waiting for them to figure it out. Here are some theories about how glass breaks. Unlike regular fluids, non-Newtonian fluids change their behavior based on your interaction with them. For example, when one type of non-Newtonian fluid is introduced to high stress, like a fast hit, its viscosity increases, and it thickens up to act like a solid. This is because the particles inside a non-Newtonian fluid are many times larger than in a regular fluid. When exposed to an action that would result in a very fast deformation, they simply don’t have the time to move around and reshape their form, so they resist. When approached gradually, the non-Newtonian fluid will act as expected. Quicksand is a natural example of this phenomenon. Here's an in-depth further read, and a very entertaining video. Most spiders spend their time weaving great networks of webs to trap any unfortunate visitor. Rather than take the passive approach, the gladiator spider has inverted the process and leads a rather active hunting life. It carefully weaves a quadratic net, which is very elastic, and although not very sticky, it does well to entangle whiskers, bristles, and hairs. When it’s ready, the gladiator spider waits for the perfect moment. Its eyes are very developed and allow it to spot prey in near darkness. After it’s close enough, the spider pounces downward while extending the net, trapping the insect. Watch the full video here.